Discover the unique natural beauty of the Canadian Rocky Mountains on a 10 day motorcycle tour through Canada. This KeaRider motorbike tour begins in Vancouver/Canada, which is regularly named to be one of the most livable cities in the world. Over endless highways you will travel up to the Rocky Mountains and the Jasper National Park. Be enchanted by the picturesque panorama of the green shimmering Lake Louise set against the backdrop of snow-covered mountains, before you leave the Banff National Park and continue on to the winter sports region of Calgary. In historic places such as Fort Steele and Revelstoke you can learn more about the gold rush in western Canada. Before you gradually return to Vancouver where your road trip of Canada ends, you will ride through the Selkirk Mountains. After an individual journey, you head for the Grandview Highway along numerous Indian reservations to the gold mining town Cache Creek. On today's trip, you cruise along endless highways of the Rockies and enjoy the beautiful nature scenery, until you reach Valemount in the afternoon. Passing Mount Robson you will drive to Jasper National Park, where you can take a boat trip on the Maligne Lake. Overnight stay is in Jasper. Today you will experience one of the biggest highlights of the Canadian Rockies in Banff National Park: the Athabasca Falls, Sunwapta Falls, and finally Lake Louise. In the morning there is an optional cable car ride in the Banff National Park, before your motorcycle tour takes you south to the cowboy town of Calgary. Today a relaxing cruise on the highway is planned. The route runs via Pincher Creek to Cranbrook. After visiting visit the historic Fort Steele, you continue on to the Glacier National Park. Riding over the Rogers Pass you will reach Revelstoke, where the Railway Museum awaits you. On the agenda today is one of the most beautiful motorcycle roads in North America: The ride from Revelstoke to Nelson on a section of the Selkirk Loop. You will be travelling along the Kooteney River, pass the Bonanza Pass and will finally arrive in Kelowna for today's overnight stay. 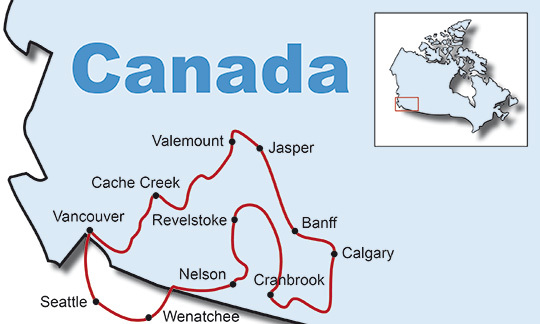 The last day on the road takes you on the Trans Canada Highway to the former gold mining town of Hope and then to Vancouver for your individual journey back home. All pricing payable in Canada Dollar.